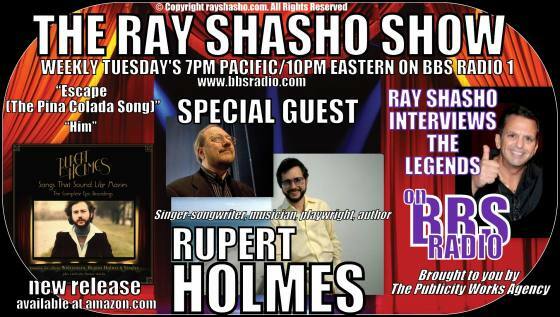 Very special thanks to Teressa Jennings for arranging this interview with RUPERT HOLMES and of course the dynamic duo of Doug & Don Newsom of BBS Radio for making the magic happen for each and every broadcast of The Ray Shasho Show. If you have comments of suggestions for the show contact me at therayshashoshow@gmail.com. Called “an American treasure” by the Los Angeles Times, “brilliant” by the London Times, “a comic genius” by Kirkus Reviews and “a true Renaissance man” by Newsweek, CBS Sunday Morning, Playbill magazine and scores of other publications and websites…mystery novelist-playwright-composer-arranger-screenwriter-conductor-singer-songwriter Rupert Holmes is the first person in theatrical history to solely win Tony® awards as an author, a composer and a lyricist. Called “an American treasure” by the Los Angeles Times, “brilliant” by the London Times, “a comic genius” by Kirkus Reviews and “a true Renaissance man” by Newsweek, CBS Sunday Morning, Playbill magazine and scores of other publications and websites…mystery novelist-playwright-composer-arranger-screenwriter-conductor-singer-songwriter Rupert Holmes is the first person in theatrical history to solely win Tony® awards as an author, a composer and a lyricist. His second Random House novel, Swing, reached #24 among all books at Amazon, and was the first novel to come with an original CD musical score. His short stories have been anthologized in such prestigious collections as Best American Mystery Stories and On a Raven’s Wing. 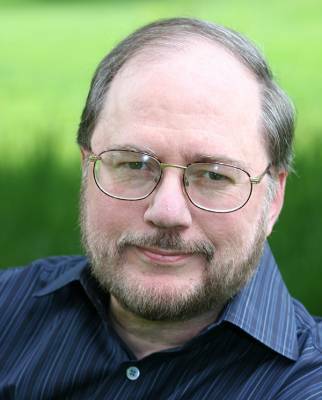 In December of 2014, ASCAP presented Rupert Holmes with its prestigious “George M. Cohan Award” acknowledging the diversity and depth of his career as a composer, lyricist, playwright, and novelist. For TV, Holmes created, wrote and scored all four seasons of the critically hailed AMC series “Remember WENN,” commemorated on its tenth anniversary by a cover piece in the Arts & Leisure section of The New York Times. He has arranged, conducted and written platinum recordings for Barbra Streisand, including her classic Lazy Afternoon album and his songs for the Golden Globe-winning, quadruple Platinum Billboard #1 LP score of A Star is Born. As a pop tunesmith, his work has been recorded by the leading vocalists of our time, from opera star Renée Fleming to pop star Britney Spears, from balladeer Barry Manilow to rapper Wyclef. Yet despite all the above, Holmes is still best known to the public as the singer-songwriter of several Billboard Top Ten hits, including his #1 multi‑platinum smash “Escape” aka “The Pina Colada Song”…heard in such recent films as Guardians of the Galaxy, The Secret Life of Walter Mitty, Grownups, Bewitched, Wanted with Angelina Jolie, The Sweetest Thing, Shrek, the TV shows “Las Vegas,” “True Blood,” and most recently performed by Jimmy Fallon and Blake Shelton with The Legendary Roots. 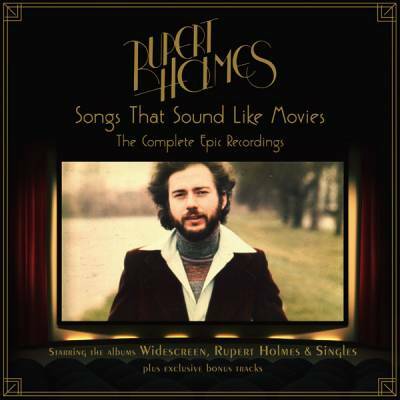 In the mid-seventies, while recording three new albums (the eponymous Rupert Holmes, Singles, and Pursuit of Happiness) Holmes also produced recordings by several major British rock bands, “in part to catch all the plays and musicals running in London’s West End each season,” he admits. The results of this were two major U.K. pop hits of 1976: “A Glass of Champagne” (with Holmes playing its trademark piano riff) and “Girls, Girls, Girls” (a “Benny Hill” standard) both performed by the band Sailor and co‑produced with Emmy award-winning Jeffrey Lesser. Holmes went on to arrange and produce the talented Brit rocker John Miles, resulting in the albums Stranger in the City and Zaragon and the single “Slow Down” a #2 dance hit on the US Billbard Disco charts featuring a memorable orchestration by Holmes. Other acts in Holmes’ producing repertoire at this time were the glam-rock band Sparks, the classic art rock band Strawbs and British pop singer-songwriter Lynsey de Paul. In 1979 and 1980, with the release of his fifth album Partners in Crime (RIAA certified platinum), Holmes at last topped the Billboard charts as a singer, songwriter, arranger and producer with his now-iconic hit “Escape (The Pina Colada Song),” which went to number one in the United States, Canada, Australia, and Japan. Holmes followed “Escape” with the Billboard #6 single “Him” and also penned the ballad “You Got It All Over Him” for The Jets, a record which simultaneously topped Billboard’s Top 40, R&B and Adult-Contemporary charts in the number 1, 2 and 3 slots. In 2015, he performed for at the Library of Congress in concert with Steely Dan’s Donald Fagen, Natalie Merchant, rapper Ne-Yo and John Legend. With the new millennium, Holmes added novel writing to his repertoire. His critically-acclaimed mystery, Where the Truth Lies, was a Booklist Top Ten Debut Novel; his second, Swing, was a San Francisco Chronicle Top Ten Best Seller, called “imaginative, smart, sophisticated and impressively elaborate” by Janet Maslin of the New York Times. His short stories have been anthologized in such prestigious collections as Best American Mystery Stories, On a Raven’s Wing, A Merry Band of Murderers and Christmas at the Mysterious Bookshop. He was also commissioned by The New York Times to write the Arts and Leisure tribute celebrating the one hundredth birthday of Irving Berlin. Holmes is currently finishing the first entry in a new fictional mystery series for Simon and Schuster. 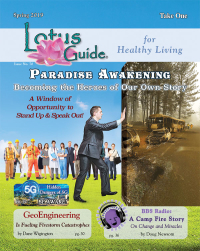 Interviewing The Legends is devoted to promoting authors and musicians worldwide. 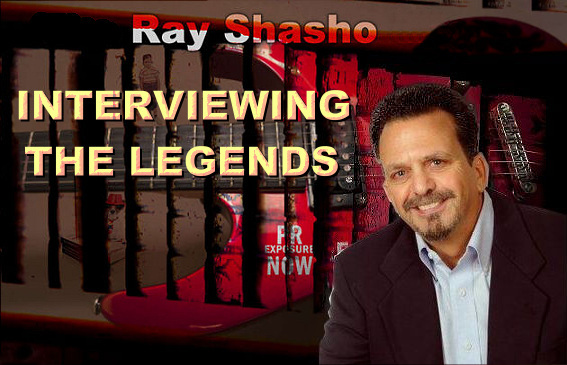 Ray spotlights exclusive interviews with both legendary and up and coming artists. 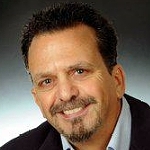 Ray also features the movers and shakers of the music and publishing industries and suggests important methods for getting the most out of your public relations and marketing methods.